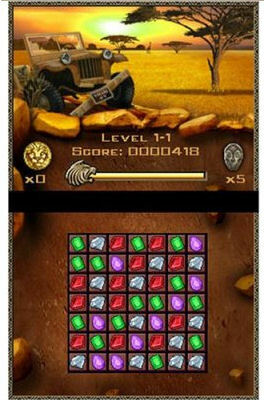 Jewel Quest Expeditions is a challenging puzzle game for the Nintendo DS. Will its many boards dazzle and delight DS owning puzzle game fans? Creating a new type of puzzle game that remains popular for nearly a decade is no easy task, but this is what Popcap games achieved when they created Bejewelled in 2001. The popular jewel matching game has spawned several sequels and similar titles across a variety of formats. One of the most popular of these is Jewel Quest, and Jewel Quest Expeditions on the DS is the latest in a long line of Jewel Quest games which have been successful on several formats. Jewel Quest Expeditions follows the adventures of hero Rupert Pack, his estranged love interest Emma Swimmingly and token villain Sebastian Grenard, as they try and unravel the mysteries of the Jewel Boards. Each Jewel Board is filled with various types of jewels. The player can swap two adjacent jewels with the stylus in order to match 3 or more jewels of the same type. Stylus control suits the game perfectly, allowing the player to quickly navigate around the board. The touch screen is as accurate and responsive as DS players have come to expect. Once a matching trio of jewels is formed, they disappear and the squares underneath them turn gold. (later levels have the squares turning silver first, then gold). The empty squares are then filled with more jewels which fall from the top of the screen. If you are able to turn all the squares to gold before the time runs out, the level is completed. Completing a level rewards you with a piece of whatever artefact you might be collecting, as well as another instalment from the games story. While the story won't win any prizes for originality, it is at least mildly entertaining and a welcome distraction after some of the tougher boards. As well as jewels, most of the boards include magic coins. If you are lucky enough to line up three of these coins you are awarded a special move. This will basically turn any square to gold instantly, very handy for completing a board with one particularly awkward square remaining. Less fun are the buried jewels, which require you to line up three jewels of the same colour adjacent to them. Some jewels are completely buried, obscuring their colour, making finding the correct colour a matter of trial and error. Later levels also include masks, which should be disposed of by shuffling them to the bottom of the screen, rather than matching three of a kind. Should you match three of these masks, your score will be drained and on later levels, the square will revert to its previous colour. The adventure mode makes up the bulk of Jewel Quest Expeditions, there are no less than 180 boards to clear. Later boards become fiendishly difficult, with jewels placed in extremely challenging configurations. Once you complete Rupert's story, you get to play as love interest Emma and then villain Sebastian. Although none of these characters introduces any new game play elements, Sebastian's boards are made more difficult by the fact that the squares turn silver first, before turning gold. The game card does pack in some multi-player modes too, up to 8 DS owners can compete in three different challenges. There's download play, but strangely no multi-card play. The three modes on offer are "Score Attack", which has you competing for the highest score, "Gold Rush", that has you competing to turn the most squares gold and "Buried", which tasks you with uncovering a buried jewel through trial and error. The multi-player mode works well, but feels a little under-developed. Aside from no multi-card option, each of the three challenge modes is only playable on one board. With 180 to choose from in story mode it's odd that the developers would limit multi-player mode like this. General presentation could be a little better in multi-player too. Nevertheless, the content that is available is fun and a welcome addition. For fans of puzzle games, Jewel Quest Expeditions is something of a hidden gem. The simple jewel swapping game play quickly gets addictive and dedicated players will have to invest a great deal of time to clear all 180 boards. A few extra game modes and an improved multi-player experience would have been welcome, but this is still a sparkling purchase for any DS owning puzzle game fan.